The politicians know how to use the Maoists in their areas of influence to their advantage. The Maoists may not believe in democracy, but they know that it is important to keep ties with politicians for short- and long-term gains. In public, both ridicule each other. But sadly, in this nexus, it is the innocent people who ultimately drown in the cesspool this nexus creates. These forms of collusion are not uncommon. States cut deals with insurgents, politicians militarize elections by sponsoring militias and hit squads, and governments delegate authority to local actors in a modern form of indirect rule. Cooperative wartime political orders are common in civil wars: rather than a strict dichotomy between states and insurgents, there is often a messy in-between of tacit coexistence, shared sovereignty, and spheres of influence. Governments’ militarization of elections can lead to outcomes ranging from the co-optation of non-state armed groups into the ruling party to the unintended rise of anti-regime insurgencies (I have a working paper here that explores how electoral militarization plays out). What can we learn from these politics? First, many states put up a Weberian “window dressing” that hides a grim world of coercion, corruption, and politicized neglect. Rather than a rational-legal bureaucracy providing services and representing public interests, private power is often built into state policy. Governments carefully try to manage and manipulate non-state violence, differentially enforcing laws to privilege supporters, throwing their weight behind armed allies, and only monopolizing coercion when it serves their political interests. In rural India, for instance, violence, the police, and politicians can be conjoined. Citizens can get frozen out of political influence as different kinds of armed actors dominate politics. Second, democracy and violence are far from antithetical; instead, they can feed on one another. The Maoists exploit the needs of politicians for resources, protection, and votes, while politicians take advantage of the Maoists’ desire for money and a shield from state repression. In Karachi, mainstream political parties have armed wings; in the Philippines, local strongmen with private coercive capacity are integral to building and holding political power. As an Afghan official says of the armed group/political party Hezb-e Islami, “They can work in the government, and they can fight against the government.” This isn’t just the domain of weak states in the developing world – Chicago’s politics in the first half of the twentieth century involved links between ruling parties, criminals, and non-state armed groups (and allegedly still do). These claims have important policy implications. State building was all the rage in the aftermath of 9/11, but it advantages some and disadvantages others, rather than necessarily creating a neutral, rationalized state. This helps to explain why the international efforts in Iraq and Afghanistan foundered in brutal violence, including party-backed militias, politicized security apparatuses, links between armed groups and the representatives of state power, and resistance by ruling regimes to the technocratic good governance initiatives of their foreign backers. A push for elections may simply shift the nature of violence into a murky realm that, in Will Reno’s words, does “not fit easily into a simple schema of state collapse and ungoverned spaces.” Of course, in some cases reforms and international initiatives work as planned – but the consequences of state building and liberalization gone awry can be bloody and destabilizing. Even in a world where elections have become an international priority, politics on the ground can lead to enduring forms of order that have little resemblance to conventional wisdoms about how states and democracies are supposed to work. Much of politics is about collective action, whereby groups of people need to cooperate in order to produce an outcome. One of the biggest challenges is getting people to cooperate in providing a public good, which by its nature can be shared by everyone regardless of whether they’ve cooperated in the first place. One way to enforce cooperation is via some central authority that’s external to the group (like a government). Another way, prominent in Elinor Ostrom’s work, is via internal policing by peers within the group. In this NSF-funded study by Guy Grossman and Delia Baldassarri show that a third way can work as well: developing a leadership or authority structure within the group itself. More importantly, they show that the success of such an authority depends on politics itself. Leaders need to be elected to induce cooperation. We began by demonstrating experimentally something quite intuitive—that elections increase the value of a local public good. But as we began ruling out options commonly associated with why elections are deemed beneficial, we were left with an important finding. Elections increased the value of local public goods even after we eliminate incumbents’ reelection considerations, and even when we minimize the information voters have on potential candidates, reducing their ability to select more able and more responsive leaders. We found evidence suggesting that something fundamental causes us to be more prosocial when we participate in key political process such as elections. That elections affect not only the behavior of incumbents but also the behavior of constituents who had participated in the electoral process is among the key findings of our study. It is easy to see why such a study is valuable even by the criteria proposed by Senator Coburn. Engendering cooperative and pro-social behavior is intrinsic not only to economic productivity—as was true in these farmer organizations—but also to ensuring security and peace. Granted, this is but one study in one setting, but this research agenda remains fundamental. Indeed, this agenda is the reason for Ostrom’s Nobel Prize. I just got back from a fascinating week in Rwanda with a great group of graduate students in Stanford’s International Policy Studies program. One of the hot conversation topics was Bosco Ntaganda’s surprise appearance at the US Embassy in Kigali on March 18 and his subsequent departure for the International Criminal Court. In 2006, the ICC indicted Ntaganda for war crimes he is alleged to have committed in eastern DRC in 2002 and 2003. The ICC has no police force, however, and Ntaganda remained at large continuing to fight and commit egregious human rights abuses. So his arrest and appearance at the Hague has been widely commented on as a big win for the ICC. A “Victory for Justice” as Human Rights Watch put it. In an abstract sense—or thinking about “justice” independent of the consequences of the ICC as an international institution—I can see the argument that, yes, this is a victory for justice. Typical one-line summary statements of the rationale for the ICC is that its purpose is to “end impunity” for big-time human rights abusers, including government leaders and officials. The ICC is said to be about creating “accountability” for a class of criminals who have not faced prosecution and punishment in the past. One could argue for such an institution independent of whether it has any good consequences beyond satisfaction that victims and others take at seeing people like Ntaganda in the dock. But in the next breath supporters of the ICC usually make the argument that “ending impunity” and creating accountability will have the good effect of reducing human rights abuses by increasing deterrence. The model that advocates have in mind is exactly that of policing and domestic crime: If you increase the probability of prosecution and punishment for committing certain crimes, the total amount of these crimes should go down. But the domestic analogy doesn’t work here because as noted the ICC has no police force. Instead it relies on states that are party to the ICC to hand over any indictees they happen to come across, or, as in the Ntaganda case, on voluntary surrenders. The implications of this difference aren’t immediately obvious. But there are good reasons to think that they include the possibility that the ICC will have no effect on reducing abuses or might even increase them. There are two main ways this can happen. In 2011, Tunisia held the first post-Arab Spring election, for 217 members of its Constituent Assembly, in 33 electoral districts, by closed-list proportional representation. The Assembly is slated to produce a constitution and put it before voters for ratification this year, followed by elections for a new parliament (and possibly also for a president, depending on the structure of the constitution). The 2011 results show that what PR formula is used in the next election could be critical, but also that what was best in 2011 might well be the wrong recipe for subsequent parliaments. The formula used in 2011, Hare Quota with Largest Remainders (HQ-LR), was pivotal to the outcome of that election, in which the largest party, the Islamist Ennahda, was awarded less than a majority of seats and therefore has had to negotiate with other groups in drafting a constitution. Simulations of electoral outcomes using district-level data show that, had the other most commonly used PR electoral formula been employed, Ennahda would have been awarded a super-majority in the Assembly and been in a position to impose a constitution. Whether by design or not, the dispersal of power among alliances in the Assembly was fortuitous at Tunisia’s “constitutional moment.” Going forward, however, the incentives for party system fragmentation generated by HQ-LR could impede the development of a workable party system, and Tunisian reformers should consider replacing HQ-LR with a divisor-based formula. In the world of PR, there are two main families of formulas for converting votes to seats: quota and remainders (Q&R) methods, and divisor methods. The basic principle of Q&R is to set a “retail price,” in votes, at which seats in each electoral district may be purchased by party lists, with that price then subtracted from a list’s account for each seat. As soon as no list’s account exceeds the retail price, any remaining seats are allocated, one per list, in order of the lists’ remaining votes. Lists that win seats on the basis of their remainders are, effectively, buying seats wholesale, for fewer votes than those purchased by full quota. Divisors methods operate according to a different principle, dividing lists’ vote tallies by a sequence of numbers to establish a matrix of quotients, then allocating seats in descending order of quotients until all the seats in a given district are awarded. The key point is that Q&R approaches create two separate pricing schemes for winning seats, whereas divisor systems do not. Under divisors systems, the best way for lists to win seats is to be bigger, period. Small lists stand to gain by coalescing into bigger alliances. Under Q&R, this is not necessarily so. Under some conditions, the separate pricing schemes can generate incentives for lists to “hunt remainders” – that is to forego coalitions that would put them into the retail market for seats and instead to remain apart, pursuing seats only on the remainders market. The structure of competition in Tunisia so far suggests that these pro-fragmentation conditions apply. The irony in suggesting that HQ-LR may be a problem for the development of Tunisian democracy going forward is that it was almost certainly a blessing in 2011. The figure below shows vote shares (blue bars), seat shares under HQ-LR (red bars), and simulated seat shares under DHD (green bars), among alliances that won representation in the Constituent Assembly. There are a few key things to note. First, Ennahda was the dominant party, an electoral Goliath with almost 40% of the vote beset by a field of Davids, none of which won even 10%. Second, almost every party that won any seats got a ‘bonus’ – a seat share greater than its vote share – mainly because more than 20% of the votes were split among the more that 500 lists that won no representation. Third, among top handful of lists, the bonuses were relatively equally distributed (4-6%) despite the fact that Ennahda’s vote share dwarfed those of the others. 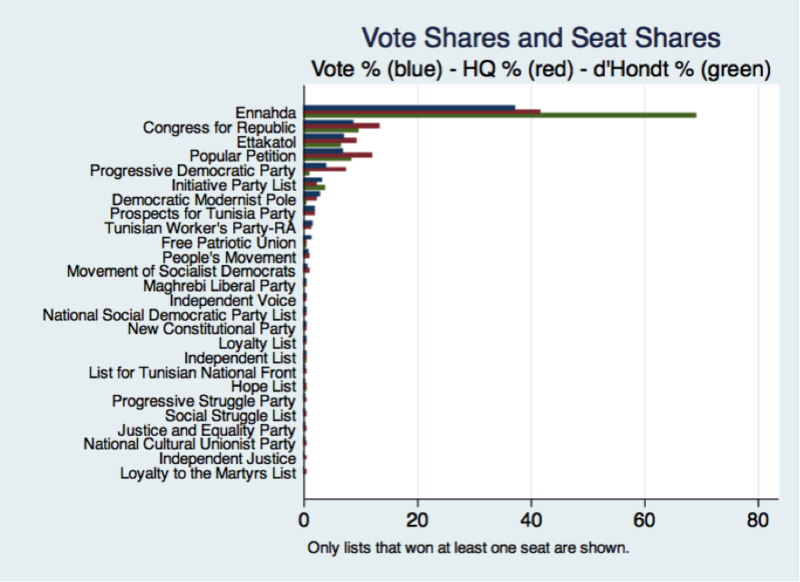 Finally, had Tunisia used DHD, the most common divisor formula, Ennahda would have captured nearly all the seat bonus itself, winning 69% of the seats. 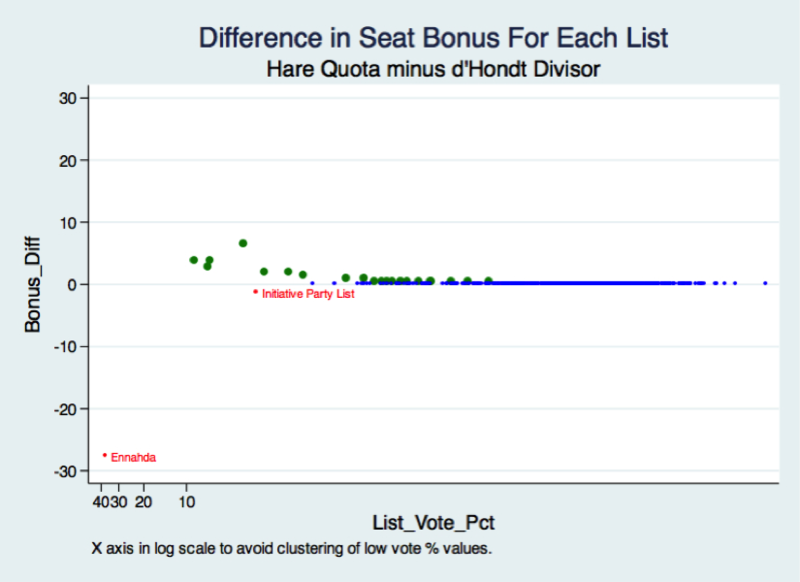 The next figure provides another way to visualize the difference between HQ-LR and DHD for the 2011 election, plotting the difference between the seat bonuses for each list under the two systems against the list’s national vote share. Points above zero (colored green) represent alliances that did better under HQ-LR than they would have under DHD; those below zero (colored red), by contrast, would have fared better under DHD; whereas the blue points represent alliances whose bonus (or penalty) was equivalent under both rules. 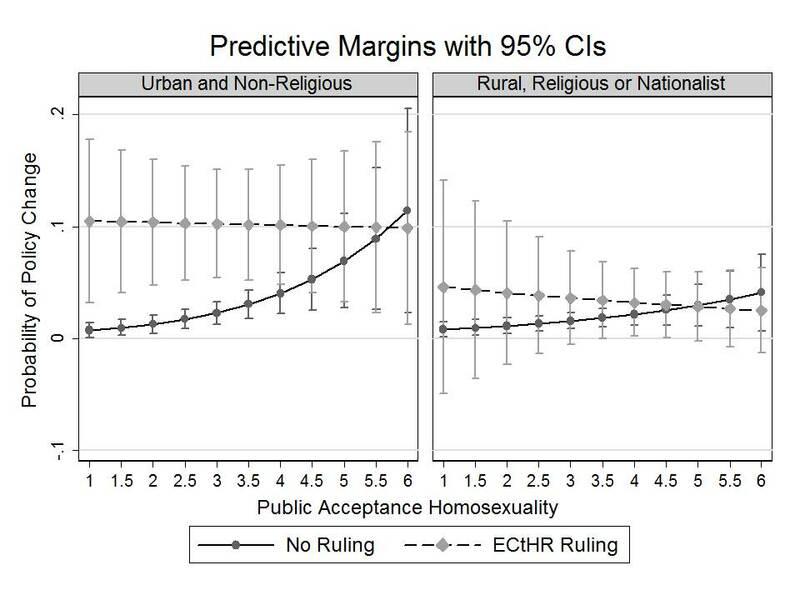 The X-axis in Figure 5 is reversed, such that reading from left to right moves from larger alliances to smaller, and is shown on a log scale to avoid clustering the abundant observations with small vote totals all on top of each other. The most remarkable characteristic of the seat bonuses generated by HQ-LR is the extent to which they accrued to small rather than large alliances. This distributive effect resulted from the Goliath-versus-multiple-Davids structure of competition in the 2011 election. Paying retail for most of its seats drained Ennahda’s coffers of votes, opening the way for the smaller contenders to buy seats at prices far below what Ennahda was paying, and capture the vast bulk of the available seat bonuses. What If the Majority of Legislators Were Women? On average, women make up about 20 percent of lawmakers in the United States and abroad. We found that when women constituted 20 percent of a decision-making body that operates by majority rule, the average woman took up only about 60 percent of the floor time used by the average man. Women were perceived — by themselves and their peers — as more quiescent and less effective. They were more likely to be rudely interrupted; they were less likely to strongly advocate their policy preferences; and they seldom mentioned the vulnerable. These gender dynamics held even when adjusting for political ideology (beliefs about liberalism and egalitarianism) and income. In contrast, the men in our experiment did not speak up less or appear to lose influence when they were in the minority. From political scientists Tali Mendelberg and Chris Karpowitz, discussed in their New York Times piece. How much of Congress’s polarization can be attributed to gerrymandering? To get at this, my collaborators, Keith Poole of the University of Georgia and Howard Rosenthal of New York University, and I decided to try our hand at gerrymandering by using our computers to draw our own districts. For each map, we used the characteristics of the districts — partisanship, average income, racial and ethnic composition — to predict how liberal or conservative their representatives might be. But even when we tried our best to create as many heterogeneous and competitive districts as possible, the predicted level of polarization was only slightly below what we observed in the real Congress. So even if there were a radical transformation of how legislative districts are drawn, the effects on polarization would be minimal. The above quote is from a recent op-ed in the Washington Post by Monkey Cage occasional contributor and Princeton University political scientist Nolan McCarty. The full piece is available here.